Contemporary Catalysis: Fundamentals and Current Applications deals with the fundamentals and modern practical applications of catalysis. Topics addressed include historical development and the importance of heterogeneous catalysis in the modern world, surfaces and adsorption, the catalyst (preparation and characterization), the reactor (integral and differential reactors, etc. ), and an introduction to spectroscopic and thermal characterization techniques. Building on this foundation, the book continues with chapters on important industrial processes, potential processes and separate chapters on syngas production, Fischer Tropsch synthesis, petroleum refining, environmental protection, and biomass conversion. Contemporary Catalysis is an essential resource for chemists, physical chemists, and chemical engineers, as well as graduate and post graduate students in catalysis and reaction engineering. 3. How does a Catalyst Work? The textbook on the fundamentals and current applications of heterogeneous catalysis, reads like a fascinating journey through the science of catalysis in the last few centuries. Foremost however, it is a unraveled course in catalysis ; enriched with very nice illustrations and numerous internet links that provide additional background. The course includes a large variety of applications, showing the sometimes enormous reactors involved, like the large top- or side fired steam reforming units (I had the privilege to work with Julian on catalytic aspects in this technology). As a bonus, readers and students, that I hope will be encouraged to take notice of this book, also get a nice insight in the state of art of literature search today. Finally, the book also provides an insight in the role of catalysis in the context of the energy transition using sustainable technology to preserve the earth and climate. Conversion of green feedstocks, like starch, into basic chemicals like (poly)ethylene, (poly)propylene requires new avenues in catalysis. This textbook is of unprecedented value in this new, solar driven field. All in all, no doubt that this fascinating book by Julian Ross will be a trusted guide for students and researchers to find their way in the fascinating world of catalysis. 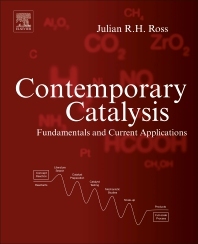 The book “Contemporary Catalysis” represents a significantly extended version of an earlier book written by Julian Ross, Heterogeneous Catalysis – Fundamentals and Applications (Elsevier, 2012). Julian is well known to the catalysis community as the former Chief Editor of the Catalysis Today, the organizer of the EuropaCat V Congress in Limerick, university professor and the co-author of many highly cited papers related to different fields of heterogeneous catalysis. This book is therefore mainly related to heterogeneous catalysis. Comparison of its contents with those of several other books on heterogeneous catalysis that have appeared recently shows that they differ significantly. The structure of the book seems optimal and I do not find anything missing. The book touches first on the history of catalysis and moves on to discuss modern trends in the development of catalysts and catalytic processes. It includes descriptions of the most important catalysis applications: environmental catalysis, partial oxidation and hydrogenation of hydrocarbons, etc. Fundamental chapters of the book consider adsorption, diffusion, heat transfer, reactors, kinetics, characterization of catalysts and similar topics. It is interesting that characterization of catalysts is not indicated on the book cover where a graphical description of the development of a catalytic process is given. It is not clear whether Julian Ross intentionally omitted this, supposing that it had already been included under catalyst preparation or testing or whether the omission happened accidentally. One of the last interests of the author prior to his full retirement was catalytic hydrogen production by formic acid decomposition. This topic has attracted considerable interest from researchers over recent years. Since Julian Ross started this project in 2007, the number of papers published per year in the area has increased by 1-2 orders of magnitude. The book discusses the synthesis of formic acid and the kinetics of formic acid decomposition in the presence of formate salts. The book includes very useful illustrations and formulas. In case a reader needs a specific formula related to catalytic studies, he/she can first search through this book and there is a great chance that he will find it. Additionally, some of the material is very original as it is difficult to find it elsewhere. I am very happy that Julian Ross had performed the serious task of writing this book and I believe that it will be useful for many years for both students and experienced scientists. I have enjoyed reading the book “Contemporary Catalysis”, by Prof. Julian Ross, and what is more important, I am convinced that it will be of great help for my classes in Chemical Reaction Engineering and Catalysis. This book will really make my job easier. Throughout its fifteen chapters, the book addresses all aspects necessary to understand what a catalyst is, how it works, and how a catalytic process is designed. The first chapter offers the reader a masterly historical review of the development of catalytic processes and the importance of these processes, illustrating the great advances that humanity has made over the last two centuries. Catalysis has allowed us to increase the amount of food, synthesize drugs, produce energy, eliminate contaminants, synthesize new fibers and materials, and many other important things. It is necessary that the student, when approaching the study of catalysis, understand its importance, and without doubt will feel motivated. In this sense, the first chapter describes the most important historical aspects in a motivating, clear and concise way. The following chapters address two important aspects to understand what a catalyst is and its behavior during reaction. So Chapter 2 focuses on the study of the adsorption process and Chapter 3 on the fundamental aspects to understand the mechanisms that take place in a heterogeneous catalytic process. Then, the study of the preparation of the catalytic materials and also their characterization is addressed. At all times it is made clear at the beginning of each chapter the importance of its contents, something fundamental to motivate students. The first part concludes with three chapters dedicated to the engineering of the catalytic processes, something fundamental so that the student can approach the design of chemical processes catalyzed heterogeneously. Once the student has understood how to prepare a catalyst, how to characterize it to know its structure, and how to approach the design of the process, the book presents seven chapters in which the main applications of heterogeneous catalysts are presented. The first section discusses the available raw materials (coal, oil, natural gas, biomass and wood, etc.) and the main reasons of energy need and sustainable development, as well as environmental reasons to transform them. Then, in subsequent chapters the different catalytic processes to transform these raw materials into fuels and materials are presented. In this way, the order that the book follows to present the contents is very logical and very accessible, which is why it is suitable to introduce students to the fascinating world of catalysis. The first chapter is motivating from the point of view of understanding the importance of heterogeneous catalysis in the current level of development of humanity. But after the second part, the student can guess the future, the new processes that will be developed soon to address the energy and environmental challenges that our society must face, something, tremendously motivating for students. It is therefore a book that presents the rigorous theoretical contents but at the same time makes the student see the application of them, motivating him to study and to dedicate his professional career in this fascinating field of catalytic processes. In addition to the logical order, and practical as well as rigorous of the book, it is written in a very instructive way. Boxes are presented with examples and stories that complement the subject. In addition, throughout the text are proposed tasks (clearly indicated) that often consist of solving small problems or looking for information on the Internet to complete what the student will learn with the book. This is also very educational way to guide students in the search for rigorous and quality information; they often have so much information at their fingertips that they sometimes do not know how to distinguish the rigorous information from data that do not have scientific criteria. Through the tasks and the examples they will gain a knowledge of diverse commercial processes of interest, and also of large chemical companies. This is something that will complement their scientific culture. In short, this book will greatly facilitate the work of chemical engineering professors, as it is very instructive and current, something essential to address the engineering subjects of the chemical reaction and catalysis; it could be used even for introductory courses of the first year, in the which is necessary that the students understand the importance of the chemical processes in the level of development of the humanity, and the role that catalysts will play in the near future. I strongly recommend the book to professors and students, and also to anyone who has a basic training in chemistry and wants to read an easy and enjoyable text that will help you expand your knowledge on a current issue as is the role that catalysts will play in the energy and environmental challenges that humanity must solve in the next decades. This book by Julian Ross is for sure not a trivial textbook for students/PhD students, although it will be very useful to them. It considers the evolution of the basics (concepts and definitions) of catalysis from the early formulations by classical researchers (Davy, Faraday, Berzelius, Sabatier, etc.) up until the present day; the most important achievements in fundamentals and practical applications are illustrated by a wide variety of examples taken from the current literature, with a proper regard for the internal dynamics of their evolution. The main attention is given to heterogeneous catalysis, that being Julian’s area of research, so many of the results for the illustrations are taken from his original articles. All the basic problems of heterogeneous catalysis are considered, these including the scientific bases of catalyst preparation based on detailed characterization of their texture, structure and surface properties; the kinetics and mechanism of catalytic reactions (including data obtained with such sophisticated methods as SSITKA, TAP, etc. ), mathematical modeling applied to the analysis of catalytic processes in various reactors; industrial processes, etc. This broad scope apparently stems from Julian tremendous experience as founding Editor of Catalysis Today, a journal dealing with the hottest problems of catalysis as discussed at conferences starting from 1987 up to date. The most original feature of this book, rarely met in traditional textbooks, is an analysis of the evolution of the catalytic publication literature, including journals, special series, etc., of the leading publishing houses. Numerous references are also given to websites such as Scopus, properly reflecting modern trends in searching for information required on specific problems of catalysis. Hence, there is no doubt that this new book by Julian Ross will be a perfect guide for students and young researches, inciting them to devote their lives to catalysis. It will also be useful for professional researchers in catalysis as it highlights new trends and ideas applicable to their studies as well as helping them to optimize their own courses on catalysis for students.